Barrio Calle La Gloria 2054, San José. Tupungato, Valle de Uco, Mendoza, Argentina. The Atamisque Lodges have been created to enjoy the pleasures of rural Mendozian life: the sun, peace, good climate, a backdrop of vines and fruit trees with a magnificent view of the Andes Cordillera; the nights of clear skies, full of stars. 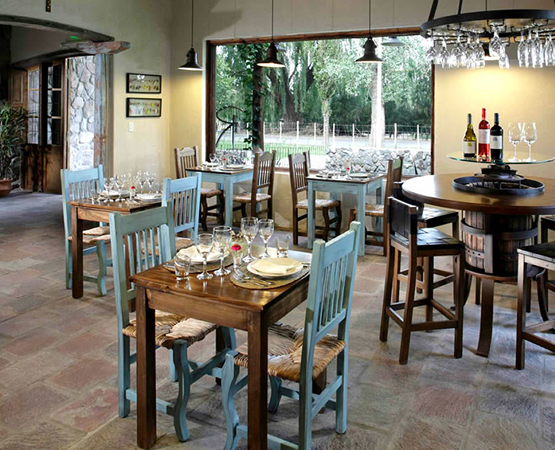 The excellent wines from our winery can be enjoyed together with the delicious dishes served at the “Rincón Atamisque”, the small countryside/rustic/rural restaurant located on the grounds, where trout, farmed on site, is the star of the menu. Atamisque Estate is located in Uco Valley, in the district of San José of Tupungato, on Route 86, famously known as the “Ruta del Vino” or “Wine Route”. At the entrance, a grove of poplars welcomes visitors. The main entry is behind a stone wall. Here, one can grasp entirely the rich diversity of this philosophically interesting project. The owners John and Chantal Du Monceau invite you to discover and to enjoy the harmony between leisure, recreation and the sound of nature. Atamisque offers to its guests several activities: a tennis court, airline tickets purchase, excursions, transfers and car hire. Also, the excellent wines from the winery can be enjoyed with the delicious dishes served at "Rincón Atamisque", the small restaurant located on the same property, where trout, raised in the place, is the main star. Guests can also visit the hatchery trout, enjoy visiting the winery and taste their wines with a sommelier, use the golf court, the tennis court or a horseback riding through the Estate with a private guide. • Breakfast, served in the Lodge or in the Lobby. • Private parking space close to the Lodge. • Luggage storage for guests travelling. • Reservation and purchase of air and land tickets. • Organisation of excursions, transfers and car rentals. In the Rincón Atamisque, the chef, Patricia Torres, 23 years old, offers a fusion between “the gourmet and the local”, with an amazing variety of recipes based on trout which are fished in the Atamisque estate’s very own trout farm. They are selected daily so are always fresh. In addition, the quality of the fruit accompanying the dishes is also highly attended to. The idea is to bring together creativity, care and exquisite tastes. The menu also consists of meat dishes and home-made pasta. Won silver medal in gastronomy from the Great Wine Capitals, Best of 2012 competition. 9 holes and all the time in the world. The magnificence of the almost centenary trees, all especially selected by famous French architect Carlos Thays, grants Atamisque Golf a setting without equal. Our golf course is an excellent option for experienced players, as well as for those who are beginning to practice this exciting sport. 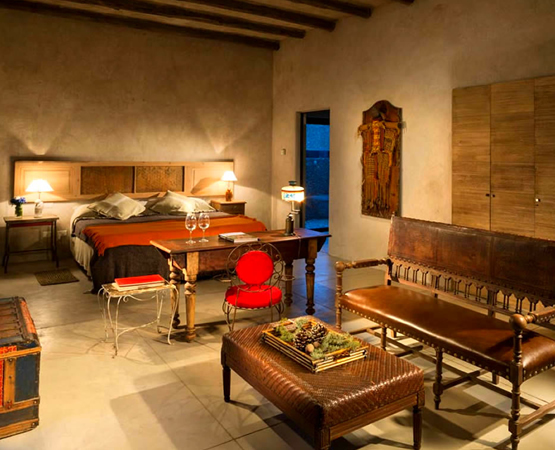 There are a total of 6 Suites divided into 3 lodges. Each suite has 67 m2. with solarium terrace, jacuzzi, king size bed, safe box, Wi-Fi internet, minibar, cable TV, telephone, hairdryer, heating, fireplace and closet. • Suites of 67 m2 with sun terrace and hot tub. 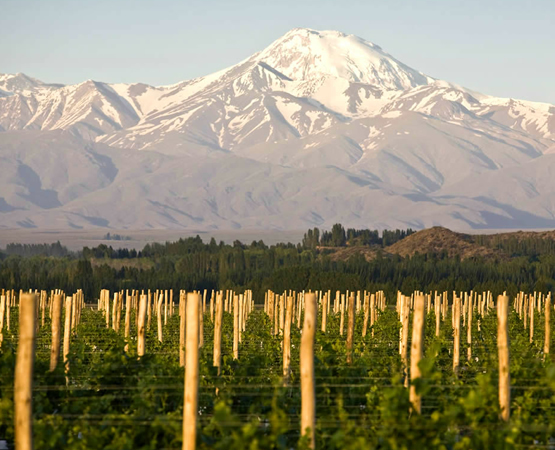 This estate was purchased in 2006 by a Frenchman, John Du Monceau, who fell in love with the place and decided to settle in Tupungato area with his wife Chantal. 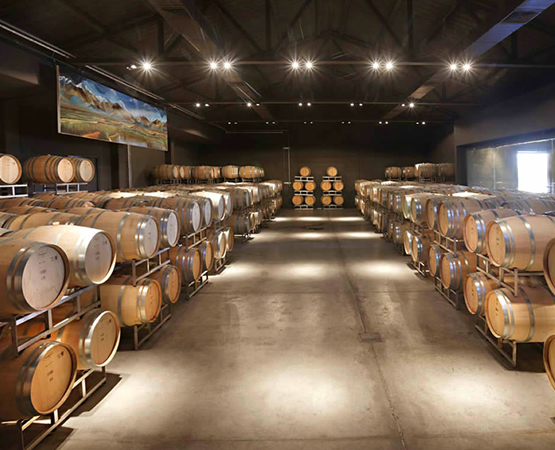 Bodega Atamisque’s construction began in 2006 and the first harvest was performed in 2007. From the very beginning, the respect for the nature has been emphasized. 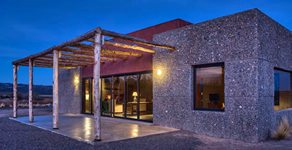 The winery’s surroundings have remained intact with their natural flora, including the regional bush atamisque, chañar, piquillo, cactus and many other varieties. Besides, the catalpa tree that grows in the estate gave origin to the name of the Premium wines line. The 70-hectare vineyards largely supply the needed amount of quality grapes. Bodega Atamisque only buys some Malbec grapes coming from 80-year-old vineyards and some Cabernet Sauvignon grapes coming from ancient vineyards. The production focuses on Premium wines, using first-quality French oak (Taransaud, Demptos) and reaching impressive fruity wines with long aftertaste and not so high alcohol content. The winery has a production capacity of 500.000 liters and was designed in tune with the lawys of gravity, so that the vinification process would follow the natural fall and flow required at each stage without having to use pumps. The grapes are from our own vineyards (we have 70 hectares of vines) which lie at an altitude of 1.300 meters above sea level. As well as the classic Malbec, we have taken advantage of the cooler climate typical of this area and produce Chardonnay, Sauvignon Blanc, Pinot Noir, Merlot and Cabernet Sauvignon. • Atamisque (Assemblage, Cabernet Sauvignon, Malbec). • Serbal (Malbec, Chardonnay, Rosé, Viognier, Sauvignon Blanc). •Sparkling Wines (Extreme, Cave Extreme, Paul Rigaud). 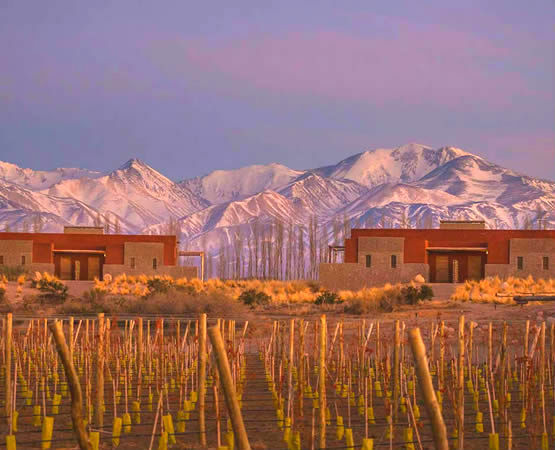 The Atamisque Estate is located in San José, Tupungato Department in Uco Valley, Mendoza. It is located 68 km. from Mendoza City (about 1 hour driving).